Each Friday on the MeetingPlay blog we showcase one of MeetingPlay’s talented and hardworking employees. We get a little personal – helping the event professionals of the world learn more about the faces behind the event apps and engagement solutions of MeetingPlay’s platforms. These team members are the faces behind the hard work that goes into creating, executing, selling, developing, marketing and everything else it takes to create the best mobile event app experience for our clients. At 12 I volunteered at a Wild Bird and Bat store my Aunt worked at. They sold items for birdwatching and birdfeeding, as well as had a Raptor and Bat Rehabilitation Non-Profit Center. I helped sell items at the store, and answered the bat hotline, a place you called for help if you had a bat stuck in your house. Mostly, I just told people to open a window and close the door. They will eventually find their way out. It was really neat because we'd get to have owls and bats sitting on our shoulders the whole day at work. I learned Customer Service, as well as how to care for and feed injured wildlife. 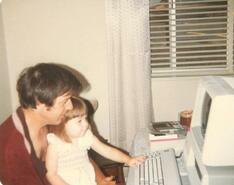 My father was a Mac tech for the Federal Government. He'd always bring home the cast off computers that were outdated or broken. Out of boredom, I learned how to take apart and put together computers out of the bits and pieces of the scrapped ones he brought home. This was back in 87. I never really considered programming or computers as a job for me, just something I did when I needed to. But, once I took my first Java Programming class, I knew that I really enjoyed it and had an aptitude for it. I ended up merging my art background with my programming background so that I could learn to 'design in code'. My father took an early retirement from his job because “kids were coming out of school knowing more than him and willing to work for less.” I learned that in the technology field you need to be a professional student and constantly learn new technologies or risk becoming obsolete. He taught me a valuable lesson in needing to adapt rapidly in this field. My favorite part about working in the tech industry is getting to be a professional student. It's always amazing to jump in on something relatively new. I love solving problems and pushing the limits of what we can do. There's always something new to learn and something new to develop. Being able to create something that you didn't think was possible is one of the best feelings in the world. I really had no idea what I wanted to be when I was 18. I always admired others who seemed to know what they were going to be since they were in elementary school. Looking back, I would have explained about “soft skills”. That you can learn anything, but developing the soft skills such as supervisory experience, project management, customer service, and problem solving is helpful no matter what direction you find yourself headed. I may not have known exactly what I wanted to be, but I should have taken on more responsibility at my previous job to have gotten the experience in those soft skills. Veronica, like the other individuals we have shared on our feature Friday's here on the MeetingPlay blog - truly encompasses and values what MeetingPlay does, and we appreciate that!